Today I came across this picture and then it hit me. 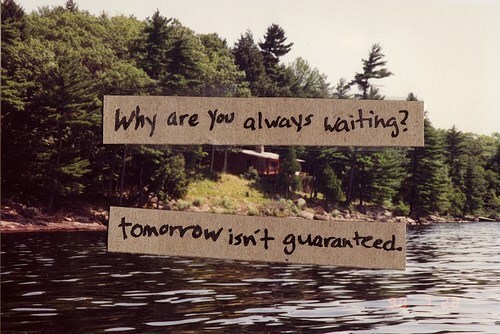 The sentence "why are you always waiting? tomorrow isn't guaranteed", sometimes crosses my mind. I make lists of what I need/want to do this week or ever in my life, but most of the time it doesn't happen or isn't happened yet. Then I think, why don't I just go for it tomorrow. Oh well, you know the bug that's called fixed obligations and that is especially school. Holidays and fun things often need to be scheduled due to a busy school schedule. A shame, because sometimes the best things are spontaneous, aren't they? Haha geweldig trouwens dat uilenpak! Moet wel gigantisch warm zijn voor zo'n klein manneke denk ik! amen! i love spontane acties!